Features Fixed, Two Column, Green, Left Sidebar, Nature. 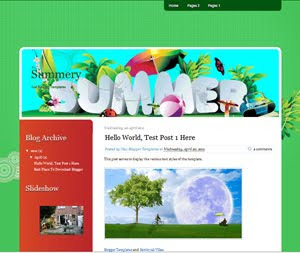 Descriptions Summery is free blogger templates with categories travel, two column, left sidebar, red sidebar, and green background. This blogger templates very good for personal blog or sites related about holiday and travel. Natural design for header with some plant and holiday atmosphere.